The ECOVACS Deebot Ozmo 610 has a fantastic minimalistic design. It comes in white color, suitable for homes in pastel color schemes. The robot is compatible with Alexa-enabled devices and Google Home. If you own any of these, you can control the robot with your voice. Also, there is a remote control in the box thanks to which you can manage the cleaner if you don't want to use the ECOVACS app. With the app, you can control the vacuum like a radio car, start and stop the cleaner, schedule it, etc. Two side sweepers, the main brush and suction work together to agitate debris sending them right into the suction path. The navigating algorithm is random. The robot is moving around until the battery is out of energy. Ozmo 610 does not remember your floor layout. It can run over the same spots a few times leaving some areas untouched. The good thing about Ozmo 610 is a suction path that comes inside the box. The path is helpful on bare floors and is ideal for pet hair since it is tangle free. The main brush works better on carpets agitating bigger debris from carpet flooring. The Ozmo 610 comes equipped with a 300 ml water reservoir and mop cloth. Ozmo mopping system keeps the amount of water dripping on the most efficient level. When the machine is not moving - the system stops dampening the cloth. The container is big enough to cover a larger area. Please note, the mopping is not able to get rid of stubborn stains. A high-efficient filter reduces airborne triggers associated with allergies and asthma. When the battery runs out of energy, the DEEBOT Ozmo 610 automatically returns to its charging dock to recharge. No mapping, navigation is random. Because of 100 minutes runime the ECOVACS DEEBOT Ozmo 610 is suitable for small and average homes. Thanks to the suction inlet, the machine is perfect for pet hair. 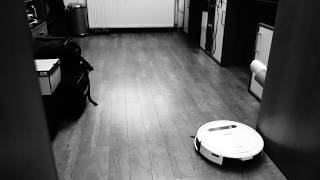 Unfortunately, suction is not capable of providing deep cleaning on carpets, yet the robot can vacuum thin carpets. If your home is hard floors have a look at the Ozmo 610, it has a big water container that provides longer operating in the mopping mode until the box gets dry.